What a busy one. I can’t believe how crazy Mr. J and I both are at work. Looking back, I don’t know that July has been my best month in the kitchen, but I made some things we liked and more importantly, ate great stuff this month, even if it wasn’t all blog-worthy. 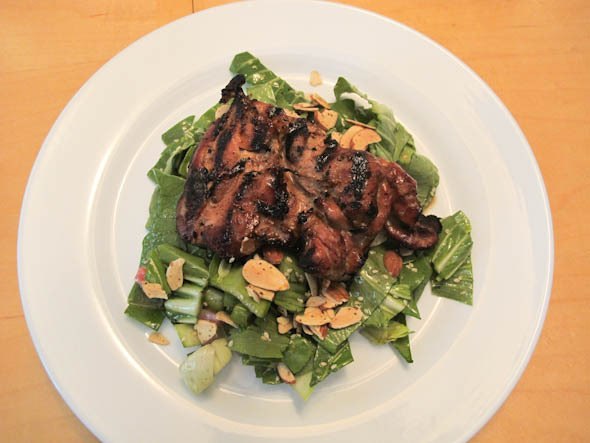 We’re all about the grilled chicken thighs and Mr. J made a bourbon BBQ sauce that is fantastic. In July, I went to River Bar (loved the view), SmashBurgers (a new fav for something quick), Frogmore (undecided), Chilacates (ah-mazing tacos), and Lala Rokh (adorable and perfect for summer). This burger with mushrooms, swiss, and herb aoli was the best thing I made this month. So good. I got a similar kind of thing as a chicken sandwich at SmashBurger and loved the combo of mushrooms and swiss. 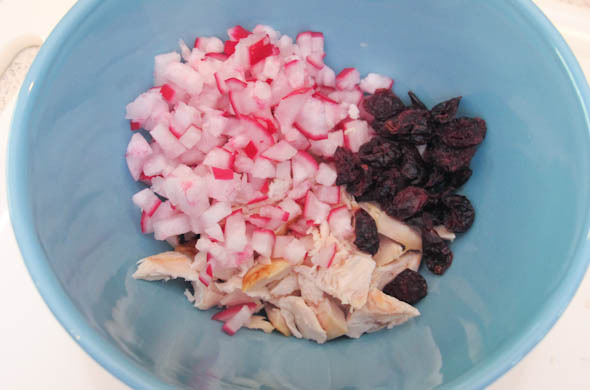 My chicken salad with radish and dried blueberries was soooo fantastic. Make it immediately. Go on a picnic. Feel fancy. 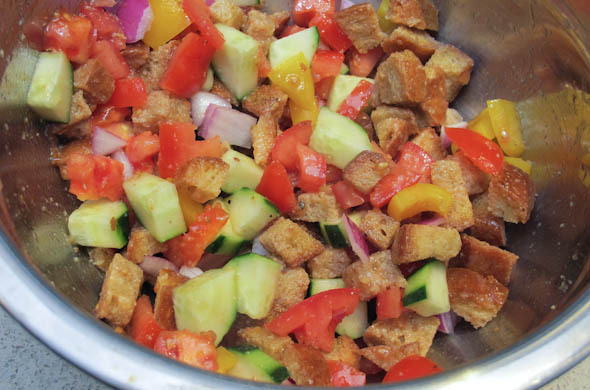 Panzanella salad just says summer and the quickie dressing is useful for anything. August has a trip to the Cape and lots more grilling in store. I’m itching to serve a burrata bar since it didn’t make the catering cut for one of my events. I have a few more burger ideas before the summer is over too. He is just so funny. I love him to pieces. 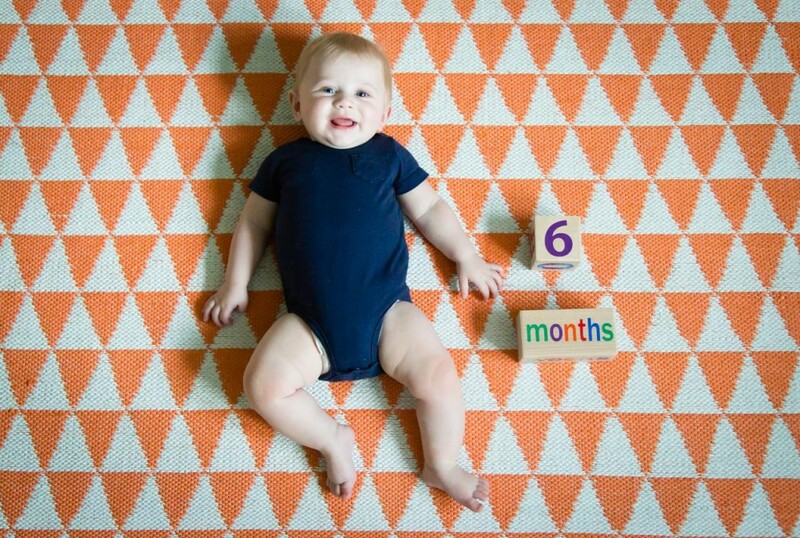 He’s 6 months old and doing SO much. He was perfecting the art of sitting and then all of a sudden figured out how to go from his belly to a seated position. He’s trying to crawl really hard so it is only a matter of time. He can scootch, so now it is time to baby proof. Wowza. He loves applesauce and doesn’t like peas. Atta boy Thomas, Momma doesn’t like peas either. We did give it a valiant effort. Thomas can find the tag on a toy so quickly…even his taggies toy, he finds the 1 real one. We all traveled to Maine and he was very well behaved. I was so proud and glad he got to meet family from all over the country. He was a CHAMP in the car even though coming home took a million hours. The Year of the Earring: I think I missed July. I’ll get on it for August. 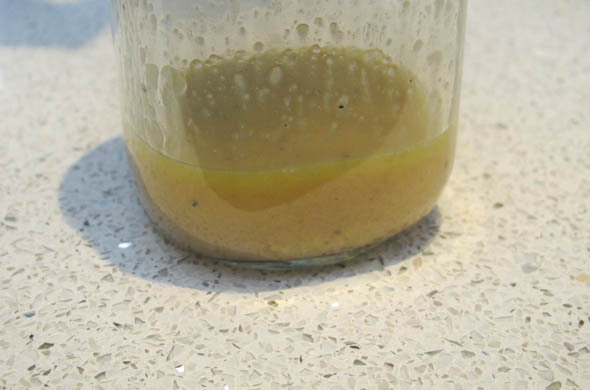 make more salad dressings: Sure did! 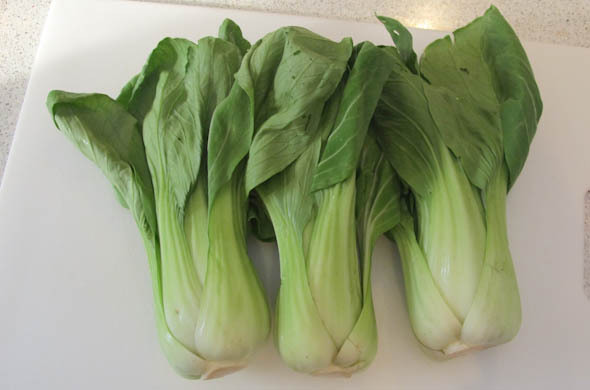 I made a Teriyaki Sesame Dressing for a Baby Bok Choy salad. factor more time into how long every-day tasks/trips will take: still learning, though I was super early to meet Mr. J for the baby’s check up so I got some steps in around the parking lot and circling the building. recreate restaurant menu items: ehh. not this month I guess. 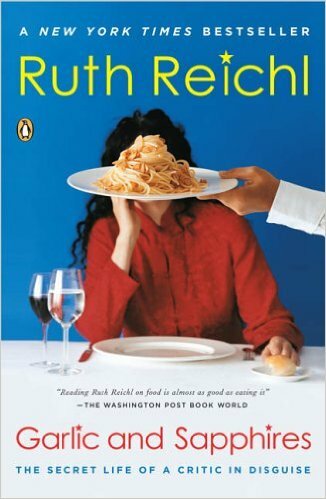 be more adventurous with my reading selections: I finished Garlic and Sapphires by Ruth Reichl and loved it. I’m ready for a new one now. use the crockpot more: Yes! I made chicken mole for tacos! There was a ton leftover so I have a freezer stock of chicken mole burritos. seafood once a month: ehh. not this month I guess. I’ll get on it. I quickly got into this book and then couldn’t put it down. I LOVED this writer and the life of a food critic is absolutely fascinating. Ruth Reichl became the New York Times food critic and then started with some disguises after learning every restaurant had her photo posted in the back for staff to be on the lookout. She wanted the true experience so her disguises allowed her to visit 3+ times to try everything. I felt like she was looking out for the normal people knowing that she got the best of the best when arriving as herself. I don’t dine at the best restaurants ever, but I do work very closely with them for my event so I could truly picture a lot of this. Ruth also reviewed everything out there…tiny Korean restaurants and toured mom & pop shops. You definitely get the sense of how much she just adores food. She does a fantastic job at showing what it is like, and how reviewing restaurants is actually work. When her little boy was wanting her home for dinner I can see it become tiresome, also when coupled with her thrift-store & wig shopping to create these personas. I think there’s a fine line for everyone to think of her very first-world problem of going out to eat every night. I get it. I found her warm and the struggle real that she didn’t get to be herself to do her job. She loves to cook and includes a recipe to wrap up each chapter. The reader falls in love with her characters, since the get-ups aren’t just costumes. She takes on the persona and uses her doorman as the tester. I love her experiences when the food blows her away and when she’s so in the moment that she can’t even speak. I love how many details she shares for the restaurant, food, and service at one she doesn’t love…like an over-priced one that isn’t worth it. She has such a realistic life perspective that makes her experiences very genuine and easy to read. For some reason, it never crossed my mind that a food critic would go to a restaurant 3-5 times before writing the review. The people and relationships Ruth has with her colleagues and friends at The New York Times was really captivating. I have seen what happens to restaurants and chefs when they’re nominated for prestigious awards. Certain ratings can do some of that as well. I loved this and would recommend it to anyone who is interested in the restaurant world with a fun reminder that outward appearances aren’t always what they seem. This panzanella is the salad that can be dinner on its own, or for me, it was just part of a crazy salad night for dinner. 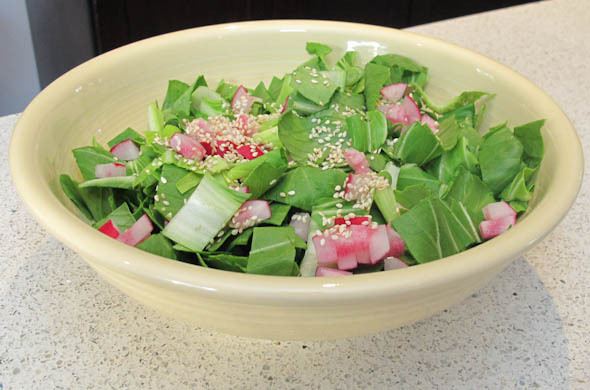 I liked the crouton-ish part of this salad, and sometimes any salad without greens if a more-fun one for me. 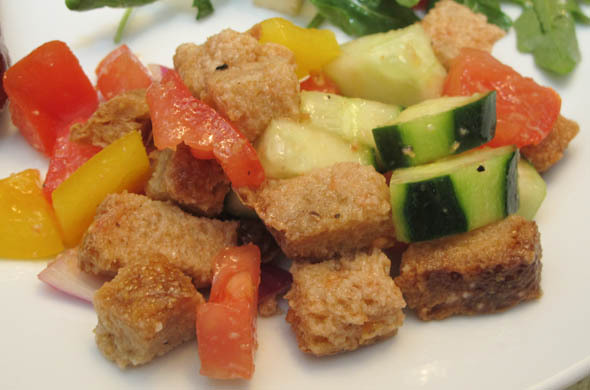 I don’t know that I’d make it all that often, but on a hot night panzanella hits the spot. Now, I just need the bigger tomatoes in the garden to ripen up. 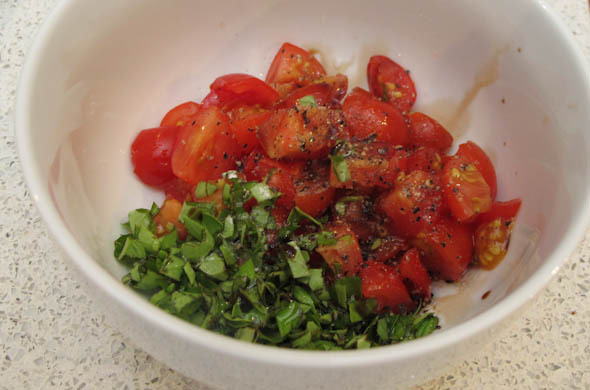 We’ve gotten some cherry tomatoes but the bigger ones are still green so I bought the tomatoes for this salad. Chop up the tomatoes, cucumbers, bell peppers, and red onion. 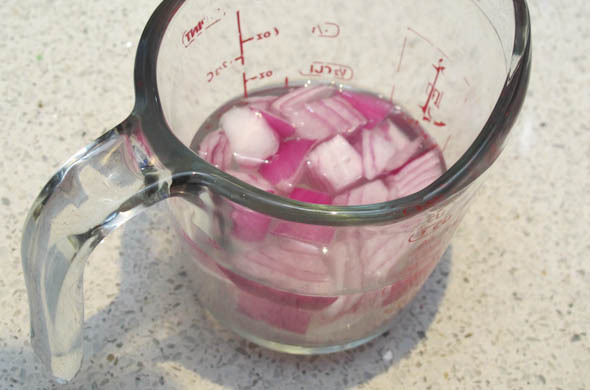 Let the onion soak for about 5 minutes in some cold water so they mellow out a bit. Heat a large skillet to medium-low heat with about 2 tbs of olive oil. 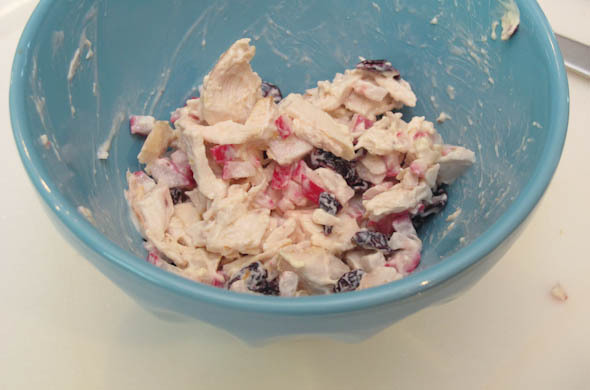 Drop the bread in and toss it around to coat. Cook for about 5 minutes until it gets just a little golden and a little crusty. 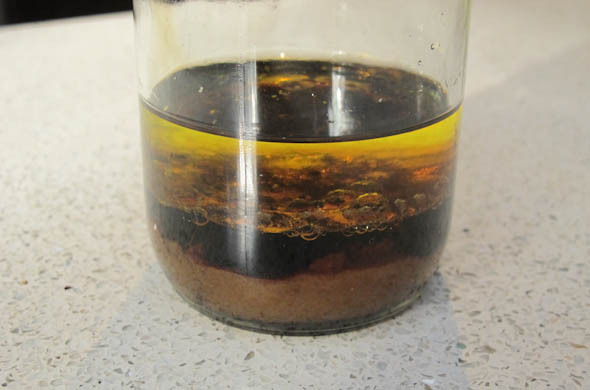 In a glass jar, add in the garlic, mustard, olive oil, vinegar, lemon juice, salt & pepper. Shake it up! 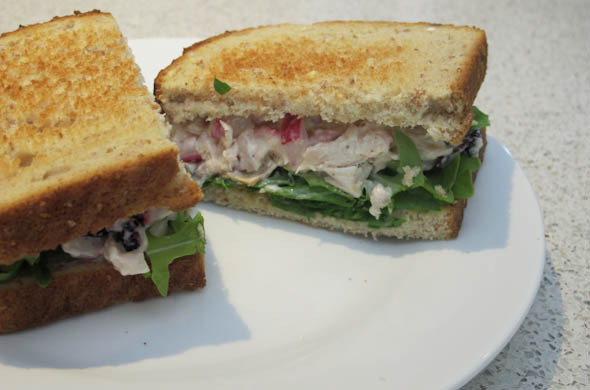 Toss the veggies, bread, and some dressing together. Let it sit for at least 15 minutes, then add more dressing if needed. Enjoy! If the tomatoes or cukes are really juicy you might not need any more dressing. I used just enough to get it all tossed – maybe half? Then another little splash before serving. I liked the bread getting a little crisp first and then soaking a bit of the dressing. I didn’t want it completed soaked and falling apart. 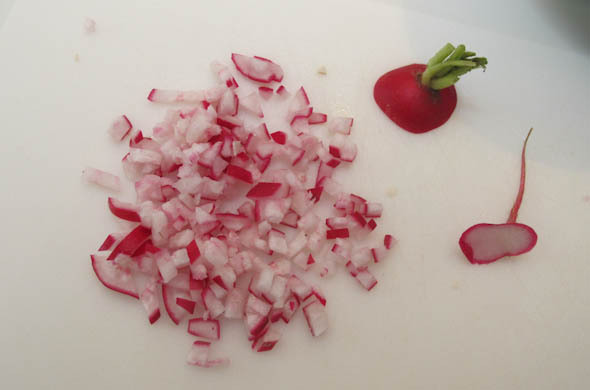 The dressing takes 2 seconds and is an easy one to use again on any salad or adding some herbs to make it a marinade. I don’t know that I’d make this all the time, but it was a great use for some leftover really good bread. 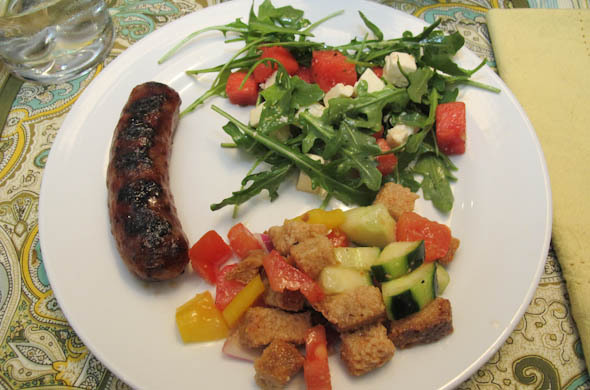 I served it on a night of two unusual salads (the other being watermelon, feta & arugula) with grilled sausage. It probably didn’t really get to shine because I was sooo into the watermelon/feta/arugula salad. Have you ever soaked onions? It is great for a raw use so they don’t overpower everything else. They maintain the crunch and some flavor but they won’t be the only taste in there. Does the swiss cheese and arugula make this American burger acceptable for Bastille Day? Ohh well, not quite on-theme but I once went to Bastille Day at the French Library in Boston and the crepe toppings included M&Ms so this is wayyy more appropriate for this French holiday (or my fav Parisian Burger). This burger has the buttery sautéed mushrooms that remind me of a steakhouse side dish. They are little sponges to soak up the butter and give an earthy flavor. 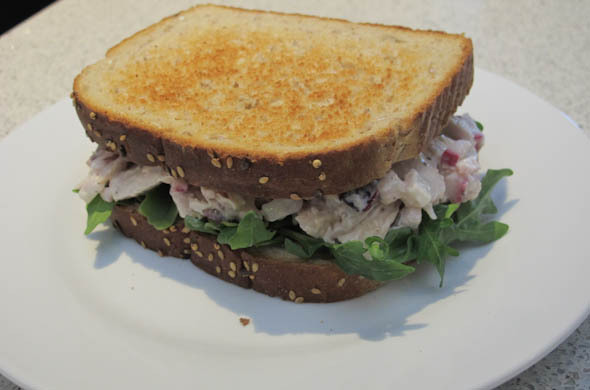 Some melted swiss + herb aoli + arugula round this out perfectly. This is soooo good as a burger, but could easily be a piece of chicken or steak on the grill then topped with the mushrooms & swiss. Heat the grill or a grill pan and begin cooking the burgers to your preferred done-ness. 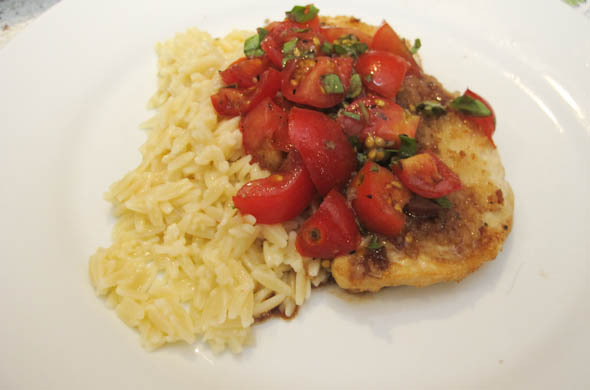 Warm a skillet to medium-low heat. Add the butter to melt. 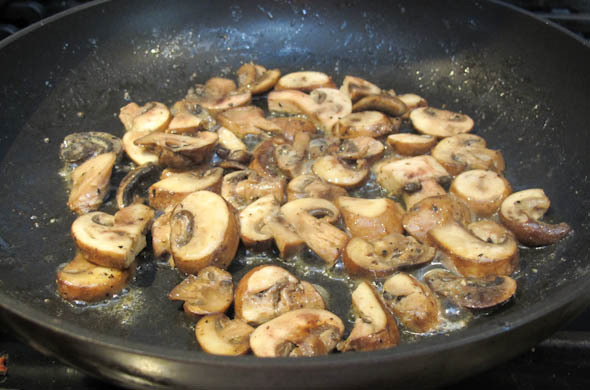 Sauté the mushrooms for about 3 minutes, stirring regularly. 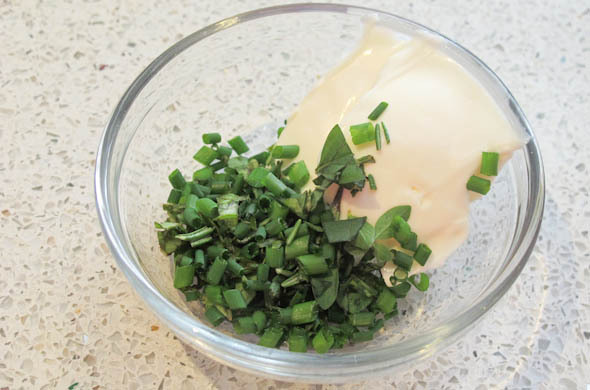 Mix together the mayo & herbs. I have a bunch of thriving herbs so I grabbed some of a bunch of them. You could easily just use whatever 2 you might have on hand. I had a 1:1 ratio of the mayo so it was suuuuper herby. Lightly grill the buns at the end and top the burgers with the mushrooms then the cheese. 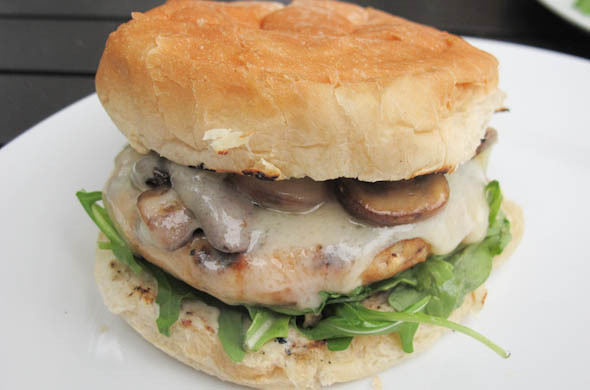 Assemble each burger with bun > arugula > burger > mushrooms > swiss > herb aoli on the top bun. It was Mr. J’s idea, our grillmaster, to hold the mushrooms on with the cheese. They were so good on this burger. I love mushrooms but not everyone is such a fan. I think because these are baby portobellos with a bit more flavor and after they’ve bathed in butter, anyone would like them! I sometimes forget that the crockpot is actually really ideal for summer meals since it doesn’t heat up the whole house, annnnd it means dinner can be less fuss when it is just too hot to think. I hate being hot. I love the snow and can’t imagine regular triple-digit-temperature days. Some crockpot food is really heavy and winter-ish but I want to keep looking for those that aren’t. I hadn’t ever made mole before but it was good, and something different. We had them as tacos but the poor pups had to smell chicken cooking all. day. 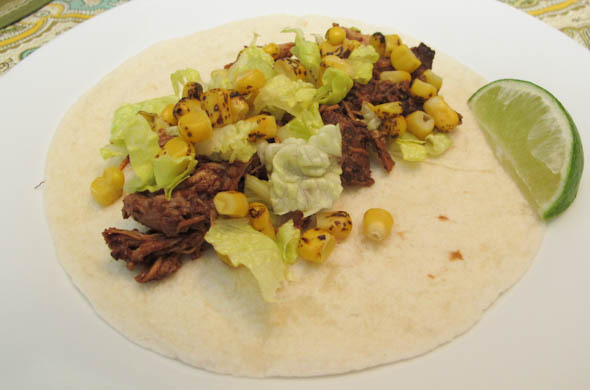 I saw the slow cooker chicken mole recipe in a Cooking Light magazine and loved the idea of chicken thighs cooking all day and making a different type of taco. I decreased the chipotle chile in adobo to just 1 (instead of 2) in case it was too spicy. I didn’t have smoked almonds, but used some mixed nuts and thought it was pretty good. I’d add a bit more water to the slow cooker…mine was on low for 8 hours (as instructed) but part of it got kind of burned along the edge when it got too low. It was good, maybe not my favorite taco ever, but the flavors were nice. The chicken had a light smokey flavor and the cocoa made it have a light earthy taste. I froze the leftover chicken and corn. I’ll assemble some burritos to wrap individually and freeze for the next time we need an instant dinner. Or it’d be good as some nachos too. 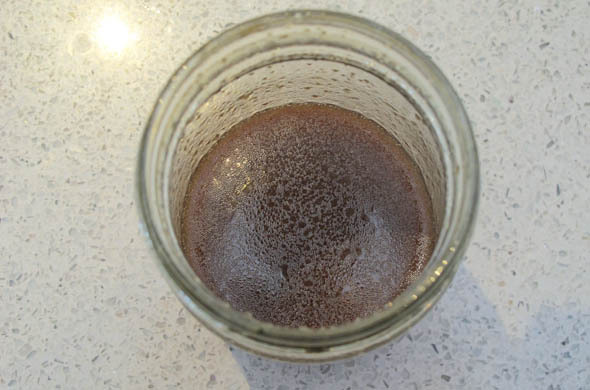 I froze some blobs of tomato paste the last time I opened a can. Then for recipes like this I just pull one blob out and nuke it in the microwave since I rarely need a whole can at once…even though the cans are itty bitty.